Are you ready for the Hella Handmade Creations October pre-order?! HHC is a third party reseller of special custom made limited edition polishes from a variety of brands. It is one stop shopping and shipping for all the polishes on offer, plus a monthly wax melt. You can see all the polishes at their shop, and most of them here in my review. Preorder sales end on October 21st at 11:59pm HST. 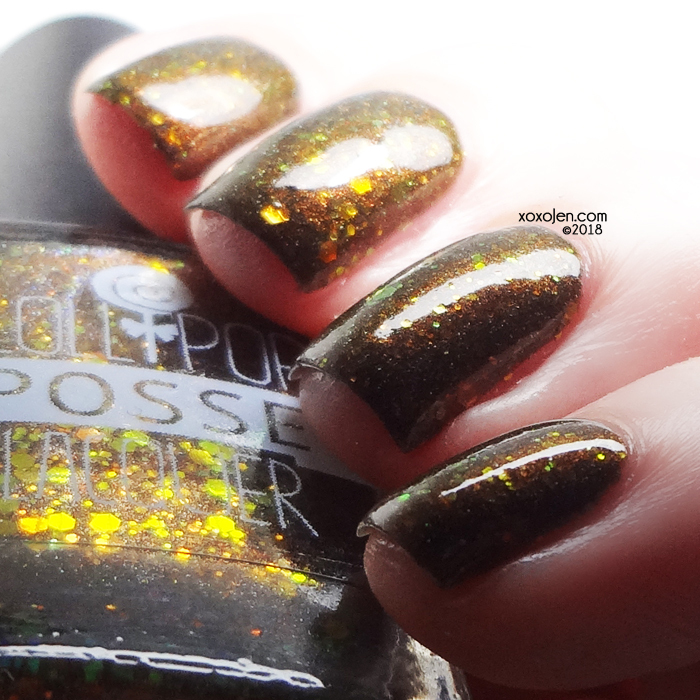 Polishes will start shipping by November 22, barring any unforeseen circumstances. Inspired by musician Liz Phair, Letters & Sodas is a greyed chocolate holo base with taupe microflakies with a reddish flash, and silver holographic pigment. Loving this mid-brown shade. It reminds me of how I drink my coffee - full of creamer. :D The application was good, no issues to report. Two coats with topcoat shown. 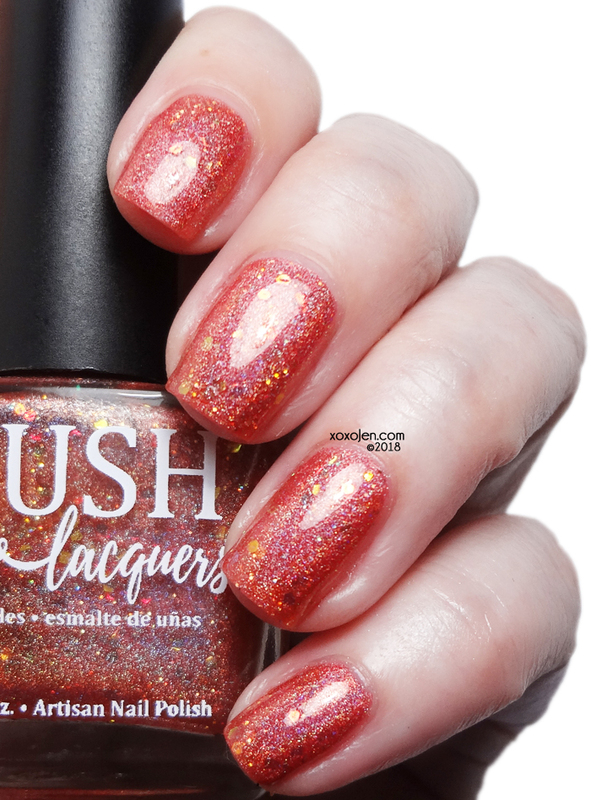 a linear holo in a rust colored base with small gold holographic glitters and larger iridescent shifting glitters of green, gold, orange and red inspired by The Pink Panther. 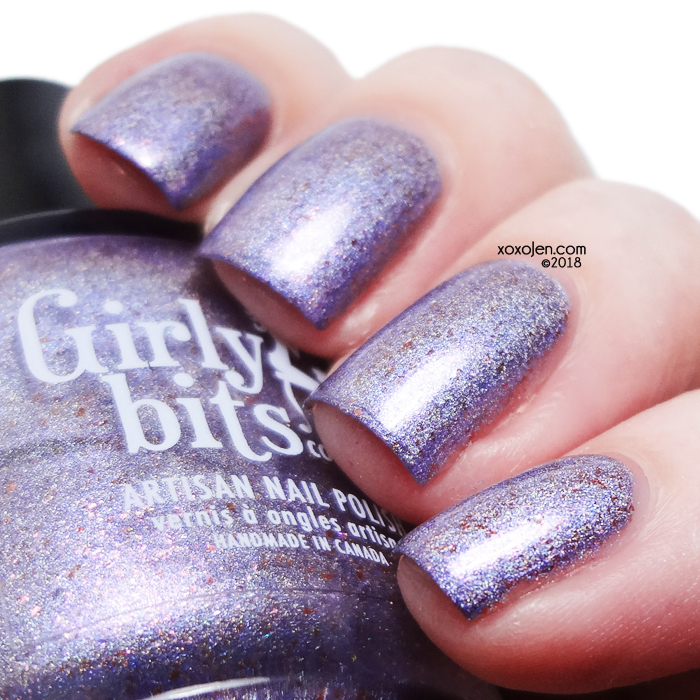 Super sparkly, and the iridescent glitter are so flashy and eye catching! A little on the sheer side but I am heavy handed when I polish so this is two coats with topcoat. Shifts from fuchsia to copper to burnt orange with red to copper color shifting particles, red micro flakes, champagne to red color shifting micro flakies, gold micro glitter, and a touch of holo inspired by Dr. Who. A nice shift that appears slightly subtle due to the range of color. 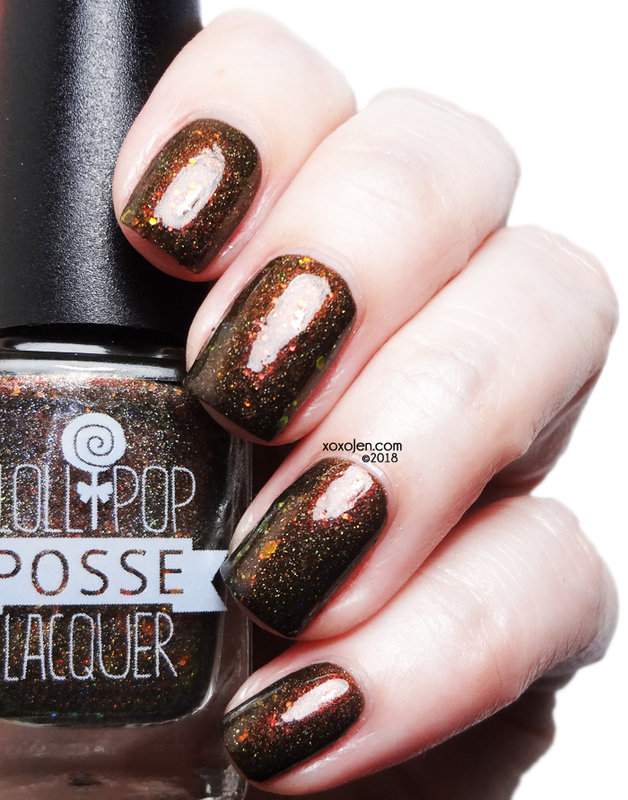 A perfect polish for fall. It is quite opaque, but two coats with topcoat shown here. 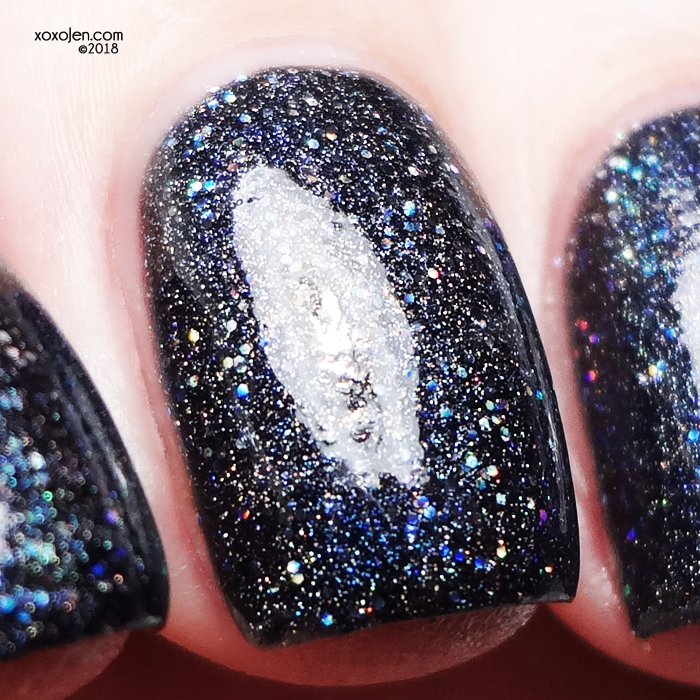 jet black linear holo with an explosion of galaxy holo inspired by Bruno Mars. 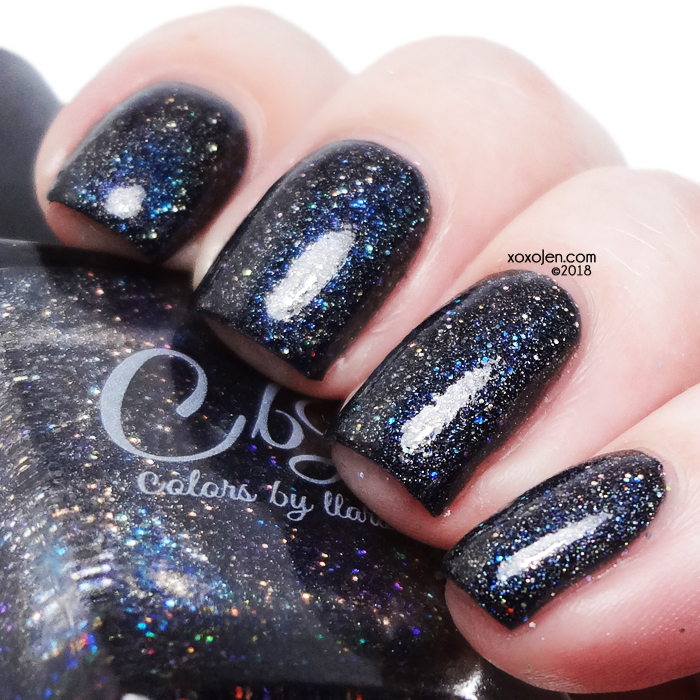 Super black holo with pin pricks of vibrant blue reflections on the galaxy holo. Two coats with topcoat shown. a purple magnetic with aurora pigment and flakes inspired by Despicable Me. Polish and magnet only or a box set which includes polish, a magnet, purple formula top coat, and Monster flakie. 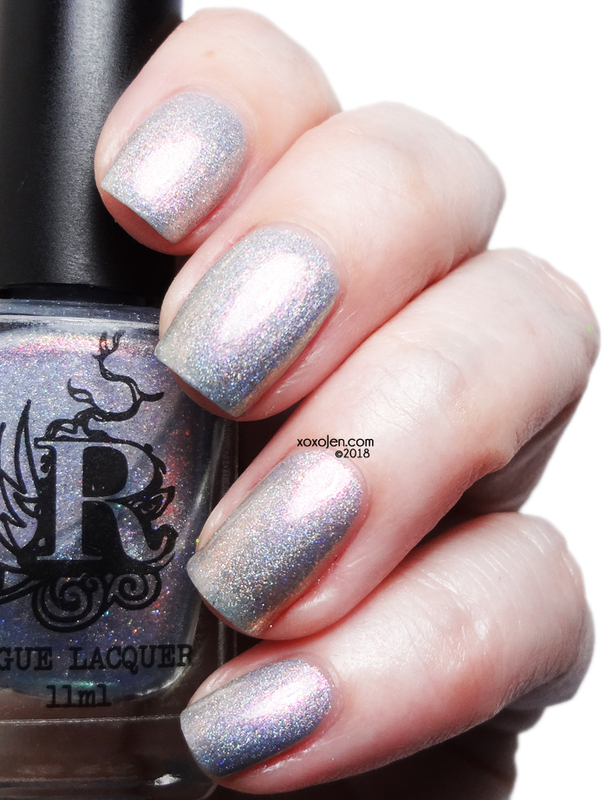 What is not to love about this polish? It's purple, magnetic, and has options to get the tiny ring magnet and those flakes. omg those flakes. You need them. Two coats with topcoat shown magnetized with the ring magnet in the picture. The flakes are shown using four different techniques. index: I noticed the cap had a very fine almost powder like coating on it when I took it off, so I ran my finger through it and then rubbed it onto this nail. middle: I used tweezers to grab and place the flakes. ring: I dipped my fingernail right into the pot. Mashed the flakes down then brushed off the excess. 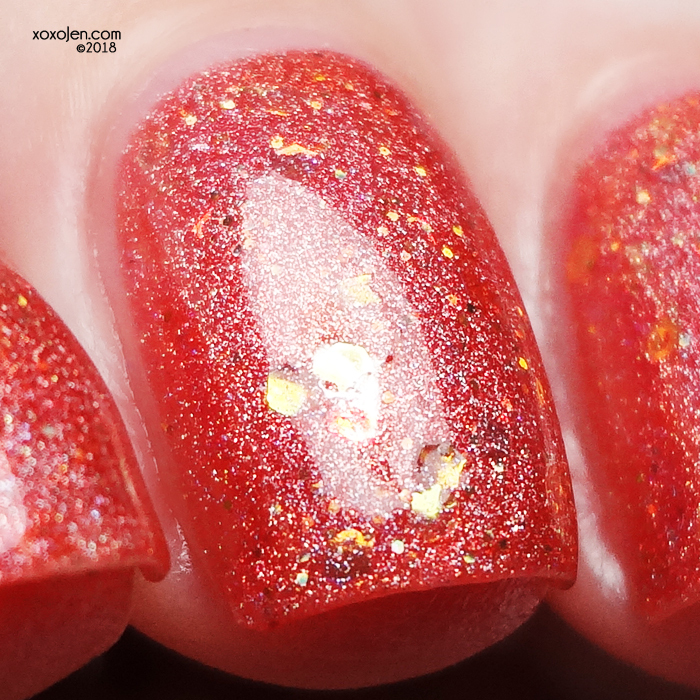 pinky: I sprinkled the flakes from the pot onto my nail to give them a light dusting. Inspired by the white rose and the scenery around her from Alice in Wonderland! A charcoal jelly base with sapphire sister UP, blue aurora shimmer and holographic flakes. In the photos look for the blue/purple shimmery-ness. It is insanely vivid in person, especially under certain lighting. I'm smitten by this one. Two coats with topcoat shown. a purple-orange-green multichrome filled with silver holographic glitters and red iridescent glitters inspired by Stranger Things. I didn't see a green shift in this one, but I definitely saw a purple to burgundy. Super vampy and the holo sparkles add flair. Two coats with topcoat shown. 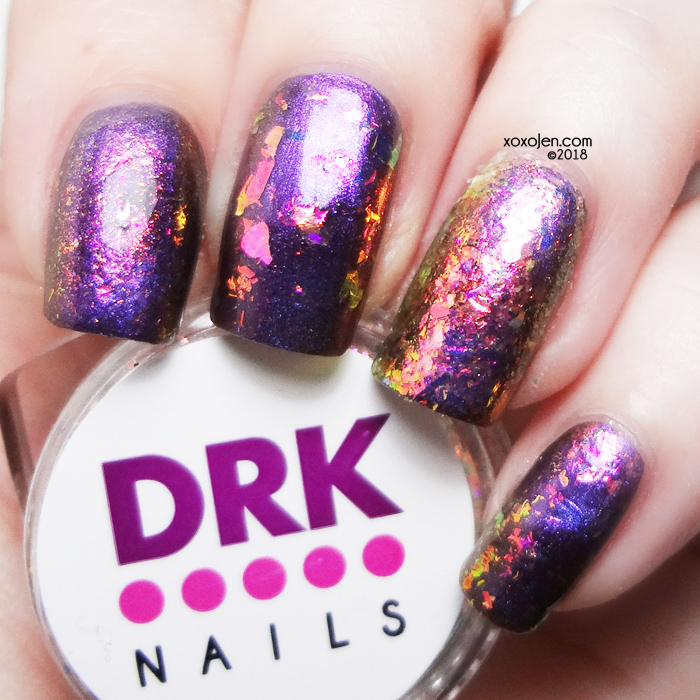 a purple holo with pink shimmer and copper-red micro flakes. Inspired by Gilderoy Lockhart from Harry Potter. 5 free, cruelty free, vegan. The microflakes had me at hello, and what better than purple? purple and coppery goodness! Two coats with topcoat shown. 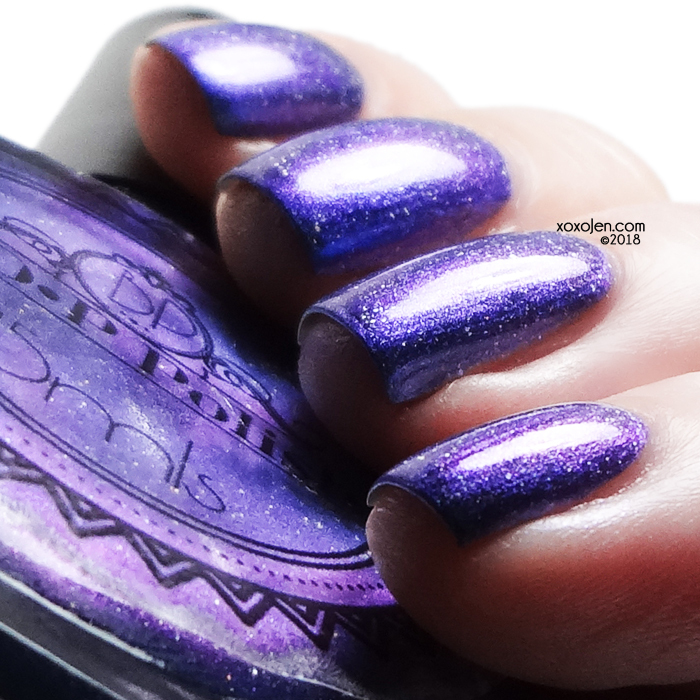 an indigo holo with gold flakes and shimmer inspired by DC Comics. Wham! Bam! Such a bright vibrant indigo shade, really packs a punch! Two coats with topcoat shown. 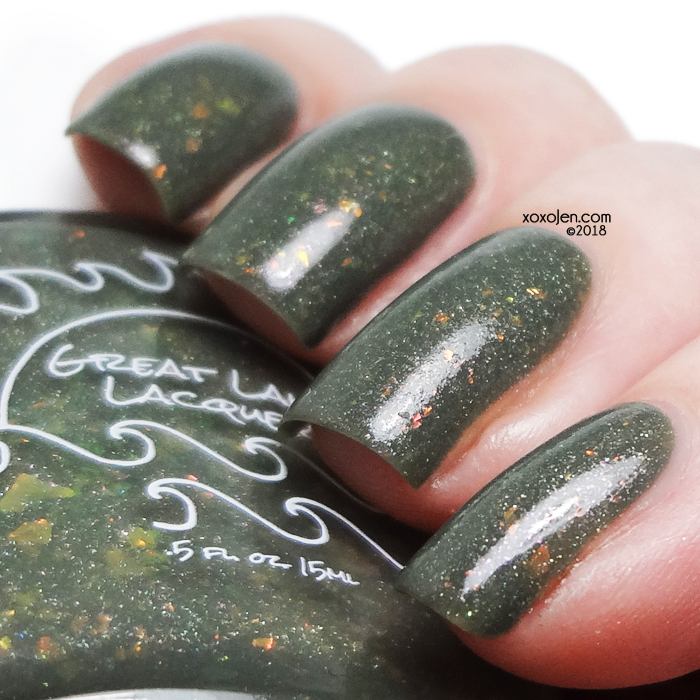 an army green crelly filled with iridescent shifting flake that goes from red/orange to gold to green, reddish purple to bronze shimmer, and a bit of scattered holo for a finish inspired by Lord of the Rings. 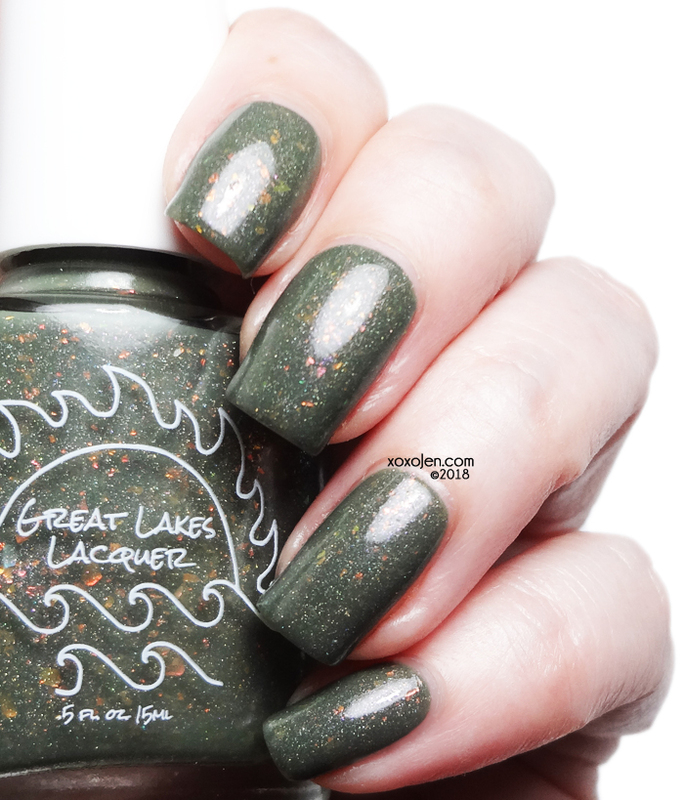 Olive green lovers won't want to miss this creamy flake polish! Two coats with topcoat shown. 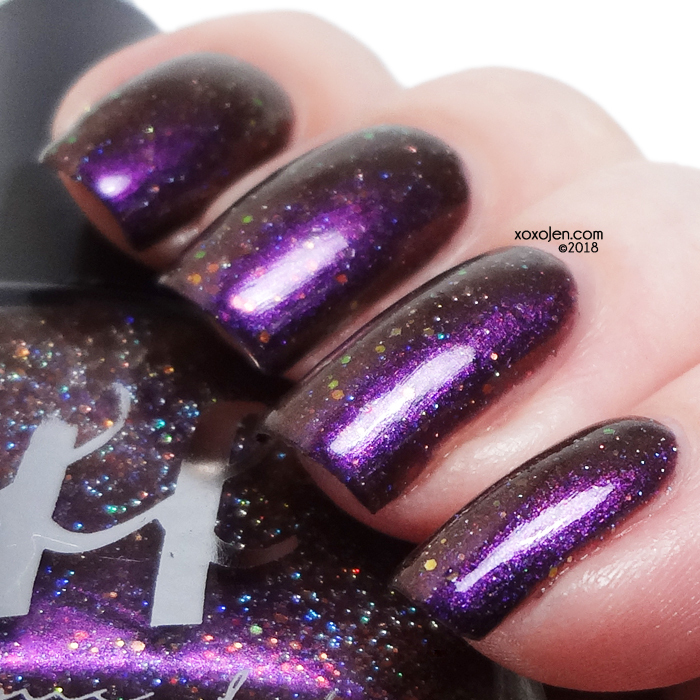 Heather's Hues H-2-Oh My Gosh! A deep green with peridot metallic flakes, lime, teal, and emerald holo, holo microflakes, and a mix of iridescent and multichrome flakes the shift lime-blue-gold. Inspired by the picture of peridot from Steven Universe. I like seeing glitters making a comeback lately. I've missed them. :) Two coats with topcoat shown. 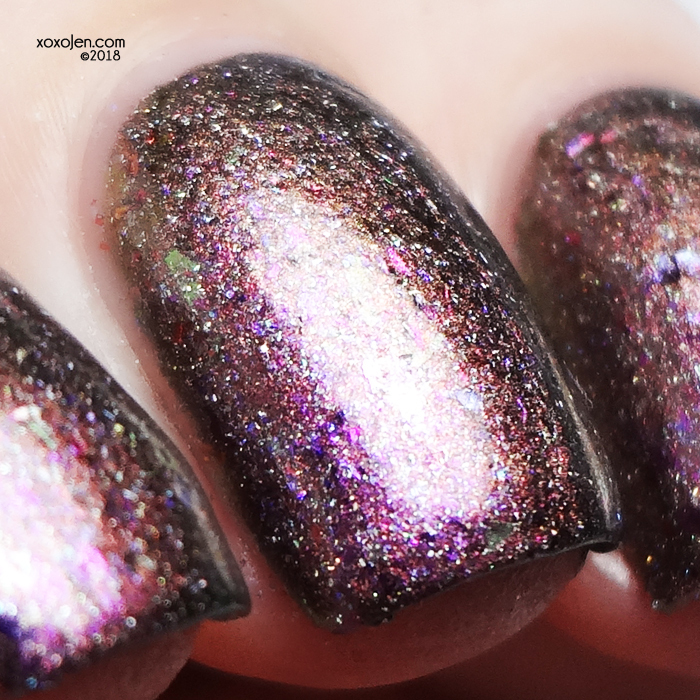 a leather-brown scattered holographic polish filled with red duochrome pigment that flashes like fire, and red/green/gold shifting iridescent glitter in multiple sizes. 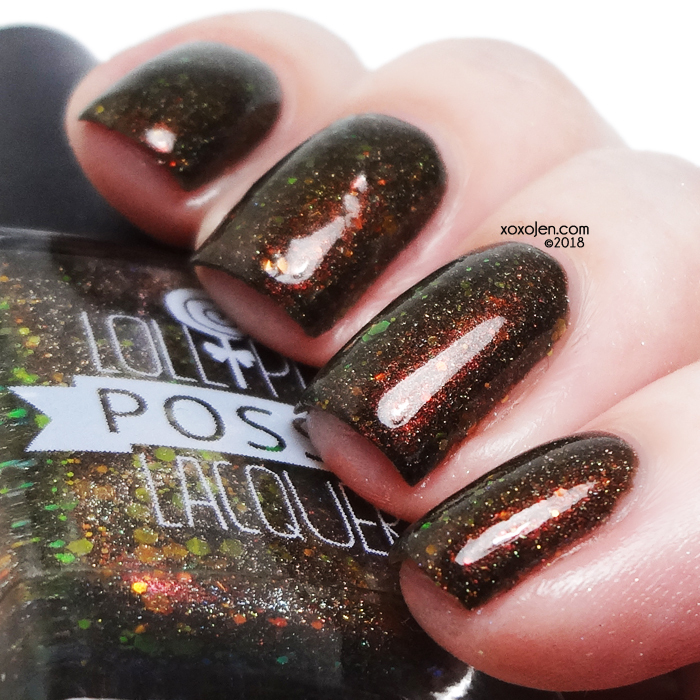 The pigment and glitter shift together for an amazing effect in this brown based jelly. Two coats with topcoat shown. a multichrome with holo sparkles & micro flakies, aurora pigments, ucc flakies and iridescent flakies inspired by childhood memories/vintage toys. Very strong shift to green in this one, and quite metallic for extra shine. Two coats with topcoat shown. 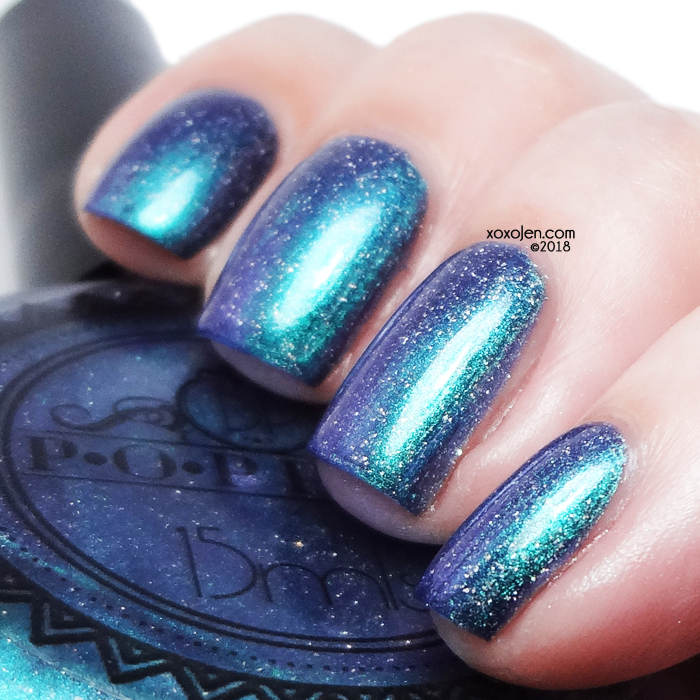 a super navy holographic with flakies. Inspired by the navy suits that united the Gallagher men on Shameless. I've been watching Shameless and look forward every month to see what Tanya will create next! 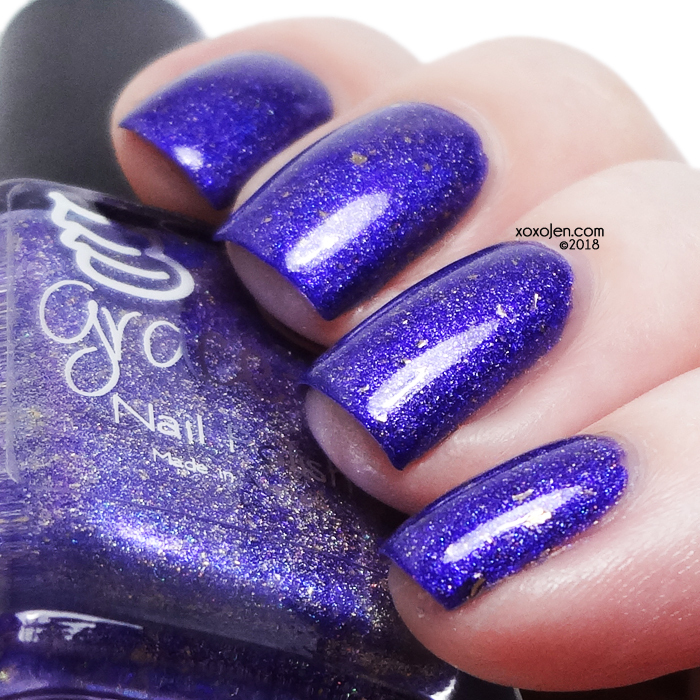 This navy blue crelly is opaque in two coats and the bits of flake flash and holo sparkle with movement. An iridescent green with purple highlight and holographic flakies. Inspired by Maleficent's dress collar and the color of her smoking magic shtick. The shift from aqua to blue to purple makes me smile. Two coats with topcoat shown. a greyed out turquoise crelly base lit from within by blue shimmers and a touch of holographic effect; inspired by Parks & Recreation. 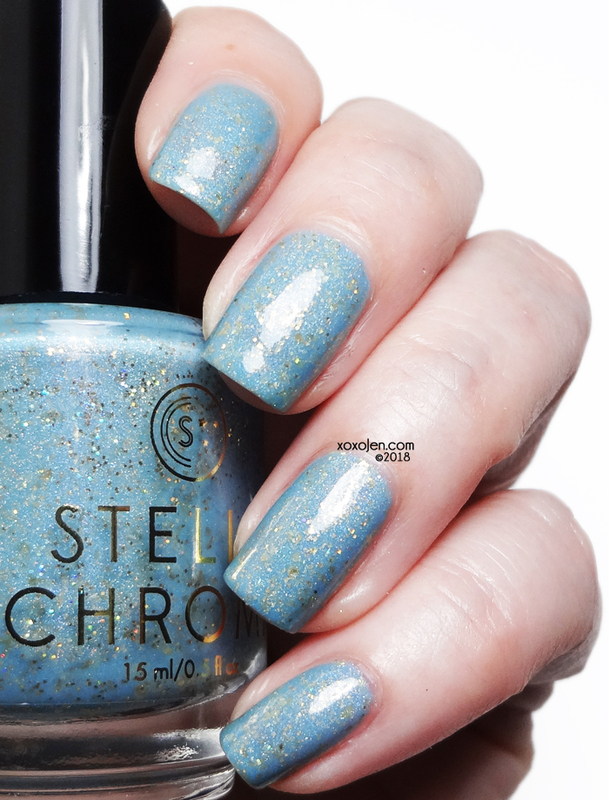 The azure shimmers in this definitely light up the polish! Two coats with topcoat shown. a pale lighting blue with red to gold aurora pigment and holo inspired by Justice League. The red flash in this is insanely vibrant, I've also shown the green shift in the images below. A bit sheer, three coats with topcoat shown. 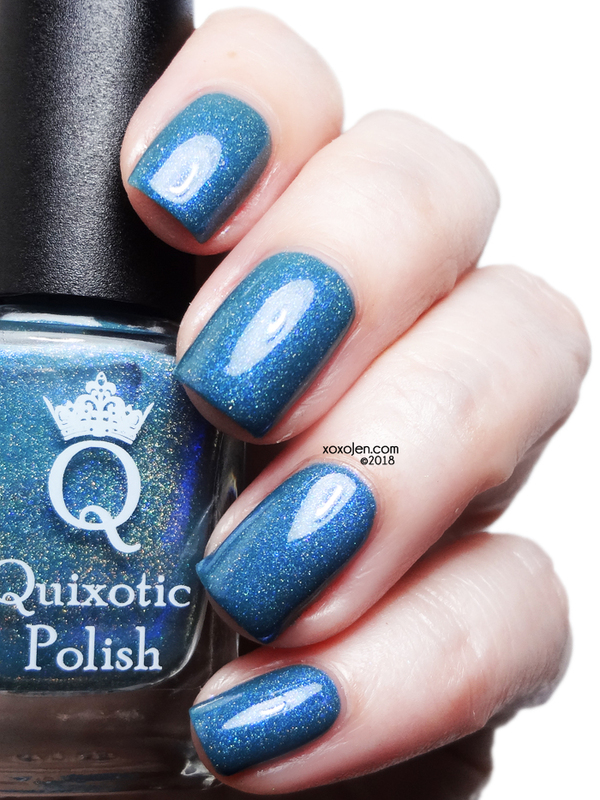 The base of the final Queens of Westeros polish is the creamy blue of House Tyrell with gold flakes, holographic gold glitter, and linear holo pigment. Sky blue speckled with gold flake and holo? Yes please. Very creamy application, two coats with topcoat shown. 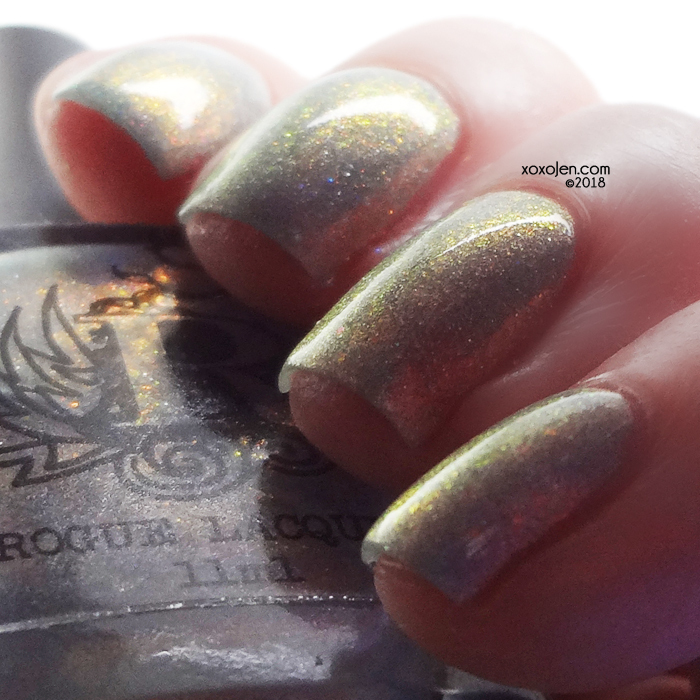 a silver linear holo polish loaded with silver micro glitters silver shimmer and silver flakies. Inspired by the Marvel's Silver Surfer. 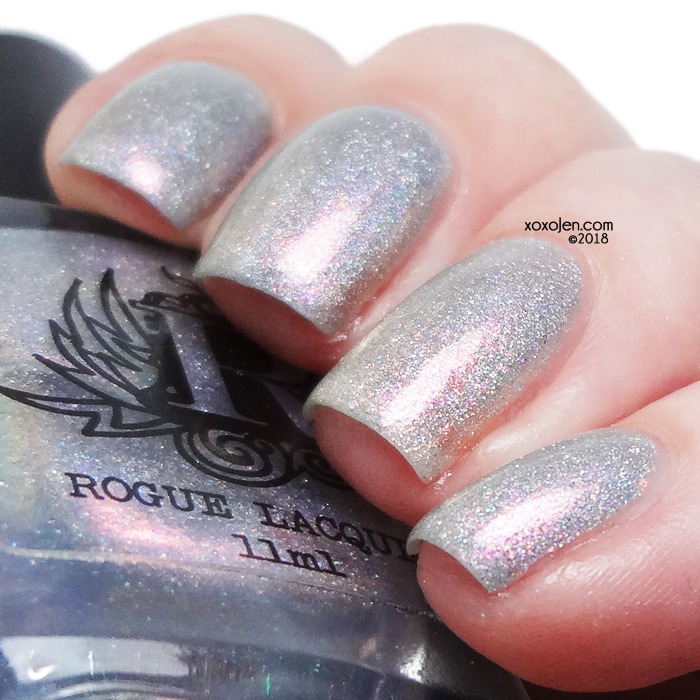 I see more of an iron grey holo, than silver for the base color. The holo is very vibrant and I'm so happy to see glitter in this. 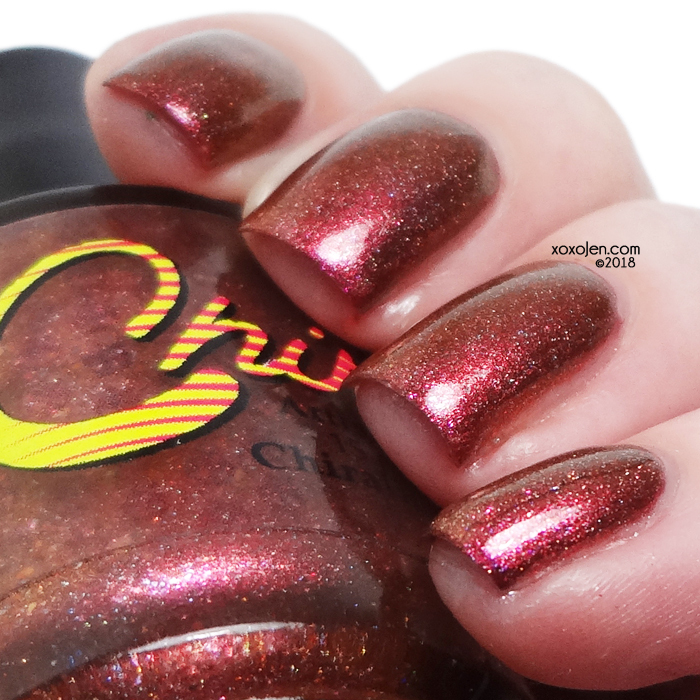 Chrissy really knows how to make a polish sparkle! Two coats with topcoat shown. 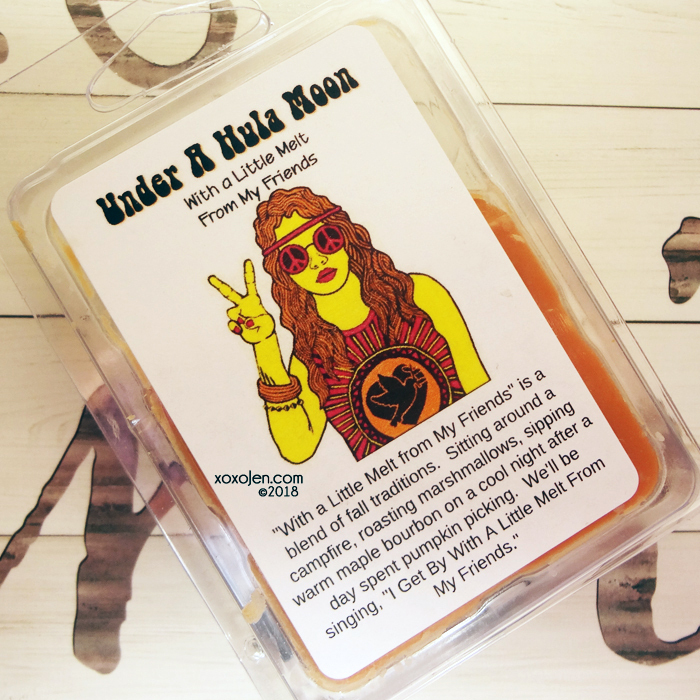 Under A Hula Moon's last wax melt in their series inspired by their love of the Beatles. 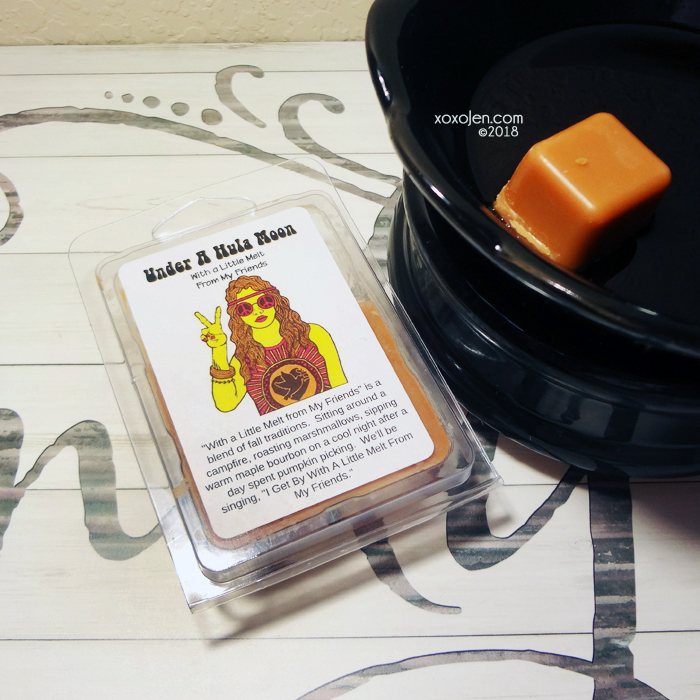 "With a Little Melt from My Friends" wax melt is a blend of fall traditions. Sitting around a campfire, roasting marshmallows, sipping warm maple bourbon on a cool night after a day spent pumpkin picking. We'll be singing, "I Get By With A Little Melt From My Friends." True to it's description, I definitely get a syrupy maple note and further into melting the campfire and marshmallows come through. I've melted two cubes from this pack and the longevity is fantastic. It's been in my warmer for at least a week, turning it on for 5-6 hours at a time. Get your shopping list together and head over to HHC at launch to get yours! So many pretty polishes. Didn't see Lilypad Lacquer "Libra".